The first combined radio and TV licence was issued in June 1946 at a cost of £2 but it was to take another six years for a method of detecting non-payers to take to the streets. Radio still dominated the airwaves (Britain's first 'detector' van had been introduced in 1926 to catch radio listeners without a compulsory ten shilling licence) and at the end of 1951 there were 12.5 million broadcasting licenses issued of which only 1.2 million included television sets but the video revolution had begun and more than 67,000 new TV licences were being issued each month. On February 1st 1952 a new method was unveiled for the tracking down of users of unlicensed television sets. 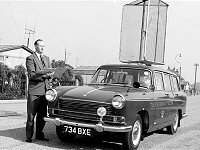 The first TV detector vans were developed at the Post Office's experimental radio laboratories in Dollis Hill, London. The detection equipment was demonstrated in front of the Postmaster General, Lord De La Warr and the Assistant Postmaster General, Mr Gammans. The Postmaster General stated that people without licences were receiving free entertainment subsidised by those who had paid and said that he was determined to discover who the non-payers were, although he was sure many people had simply forgotten to get their licence. "We are most unwilling to start a snoop campaign or to follow it up by prosecutions," he added. Claimed by its inventors to be sensitive enough to pick up the vast majority of television receivers, whether the aerials were internal or external, the units consisted of three horizontal loop aerials, fixed to the roof of a vehicle, that received signals issuing from television sets and converted them to radio waves, providing both audio and visual information. By 1955, fleets of new Hillman vans with rotating aerials were cruising suburban streets. Britain's longest-serving TV detector vehicle, the Commer van, was brought into service in 1968 and survived until 1983 when it was replaced by less sriking Volkswagen Transporters. 1922 Start of the state monopolised national radio service. The government finances the British Broadcasting Company Ltd by means of a General Post Office licence fee of 10 shillings (50p) from 1st November. 1926 Radio detector vans are used for the first time. 1952 The first TV detector vans are introduced to combat the estimated 100,000 to 150,000 people watching television without a licence. 1954 Licence issues exceed 3 million. Audiences estimated at over 20 million, with most viewers watching outside their own homes. 1955 The first ITV broadcast is made, ending the BBC television monopoly. Funding is raised by advertising revenue. 1960-1964 Television licences cost £4 ( inc £1 excise duty ) and radio licences cost £1. 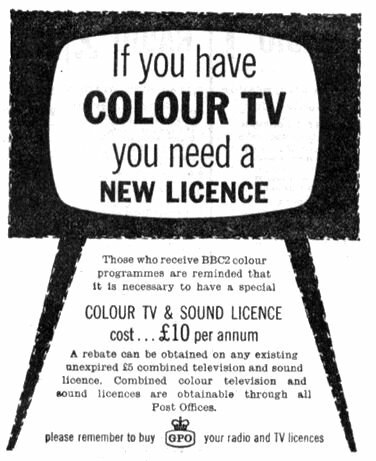 1969 Television licence price increased to £6 for black & white with a supplementary £11 for colour. 1971 The 'radio only' licence is abolished for economic reasons.Households would only require a licence if they received TV broadcasts. 1973 The first 19 independent onshore radio stations start broadcasting, ending the BBC radio monopoly.